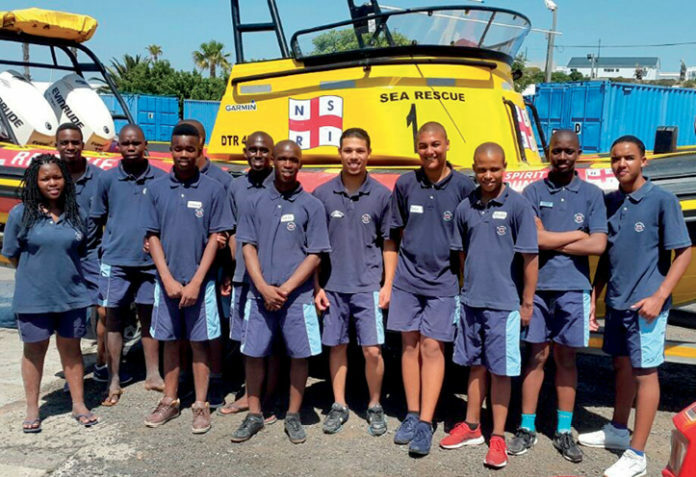 SAIMI works with organisations such as the NSRI to support programmes developing life skills and maritime skills for school learners and future seafarers. The South African International Maritime Institute (SAIMI) supports research and innovation that will help unlock the growth potential of the local maritime industry. SAIMI worked in collaboration with other research role-players to draw up the Maritime Research, Innovation and Knowledge Management Roadmap which presents a vision, and sets objectives and action steps for South Africa to be globally recognised as a maritime nation by 2030. The map provides direction for research, innovation and technology development to support achievement of the Operation Phakisa growth objectives in the Oceans Economy. It also guides SAIMI’s knowledge management strategy. The next step is dissemination and implementation of the road map, and SAIMI is working with the Council for Scientific and Industrial Research (CSIR), universities and leading research centres, to support postgraduate studies and commission new high-level research in key areas. Launched in late 2016, the road map is the result of an extensive review of existing tertiary qualifications, research and innovation activity and current strategies, together with wide-ranging stakeholder consultation in charting the way forward. It is aligned to the vision and objectives of Operation Phakisa in the Oceans Economy and integrates the research and innovation needs of the maritime economy, which takes in everything from aquaculture to tourism, environmental protection to oil and gas exploration, and maritime transport and manufacturing. Another initiative is to drive a maritime awareness campaign to develop a national maritime culture and consciousness, contributing to awareness of maritime economic opportunities, the development of a sustainable blue economy, and the profile of South Africa as a maritime nation. SAIMI also acknowledges the importance of interacting with other major institutions, not only in South Africa, but also on the African continent and in the global maritime industry. Work on SAIMI’s Africa Focus is well underway with leading teams from Kenya, Ghana and Nigeria all part of the research process. Partnerships are also being explored with universities and maritime authorities in China and Southeast Asia. SAIMI hosted maritime business students from the Massachusetts Maritime Academy, USA, on an experiential learning tour in January 2018 to understand the South African maritime sector. 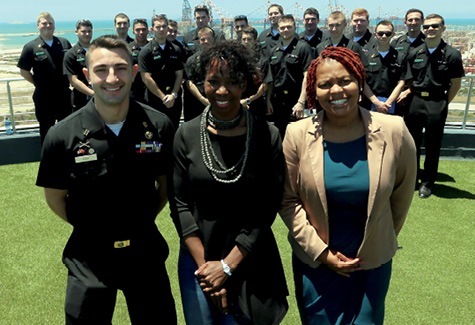 Pictured with the group at the Port of Ngqura are (front, from left) senior student Nick Zaia, the academy’s South African-born Dr Portia Ndlovu and Transnet representative Ntshantsha Buyambo. Playing a vital role in developing this burgeoning industry, the South African International Maritime Institute (SAIMI) facilitates the skills development to support growth in the sector and the country’s aim to be a leading maritime nation. “Essentially, our role is to help South Africa steer the right course in growing the skills needed for the rapid development of the maritime sector as envisaged under Operation Phakisa,” says SAIMI’s acting chief executive Odwa Mtati. Boasting, as it does, more than 3 000 km of coastline and territorial waters larger than its land size, South Africa is extremely well positioned to explore the diverse economic and job creation opportunities that lie within the marine sector. “All the natural foundations are in place. South Africa is the African continent’s only country with access to and control over sea waters covering three oceans,” says Mtati. Headquartered in Port Elizabeth, and with plans to eventually be represented in all of South Africa’s major coastal cities, SAIMI works with educational institutions, government departments and the private sector across South Africa. Its primary role is to respond to industry needs by identifying skills gaps, facilitating collaboration and development of new programmes, and coordinating maritime education and training in areas across the diverse maritime economy spectrum – from shipping and transport, to aquaculture, boat-building and oil and gas exploration, through to ocean governance and environmental management. One way of doing this is by reaching out to the younger generation, educating them about sea-going career opportunities and also offering training facilities through its management of the National Cadet Programme. Funded by the National Skills Fund, the programme – which was SAIMI’s first and still its largest project – offers practical training and sea time with international shipping lines, enabling maritime diploma students to obtain the internationally recognised Standards of Training, Certification, and Watch-keeping (STCW) qualifications and become globally sought-after seafarers. Innovative approaches to seafarer training, which have the potential for replication if successful, are being followed with some of the partner shipping companies, which recruit a small number of cadets into an intensive programme aimed at developing their own future officer corps from cadet to apprentice to fully-fledged officer. The programme has also extended its reach to school level in an effort to encourage interest in maritime careers, sponsoring holiday camps and maritime experiential programmes for school learners, along with maths and science support to ensure entry to maritime studies programmes. In addition, the institute is currently facilitating a pilot project with the Transport Education and Training Authority (TETA) for training of deck and engine ratings towards Certificates of Proficiency as Able Seafarers, to work in areas such as vessel maintenance, rigging and cargo handling for merchant shipping and the fishing industry. In a long-standing partnership with the Africa region of the International Oceans Institute, SAIMI supports the annual IOI Ocean Governance for Africa course which equips public sector officials from South Africa and the African continent to understand the maritime aspects of environmental management and planning. SAIMI is funded by a three-year grant of R296-million from the National Skills Fund for the skills and capacity-building work to support Operation Phakisa, an initiative of the South African government. The initiative was designed to fast-track the implementation of the oceans economy and address issues highlighted in the National Development Plan 2030 such as poverty, unemployment and inequality. A common thread running through all Operation Phakisa initiatives is the need to develop the skills to operate the engine room, as well as to navigate the way forward. SAIMI is at the helm of this skills development as well as capacity building and empowerment of people to support the goals of Operation Phakisa and growth of the maritime economy.